New mast, boom and rigging 1998. control lines back to cockpit. Genoa foresail with an adjustable deck track. Nylon tube for cruising shute. designed with a self lowering mast system, although this has not been used for a number of years. 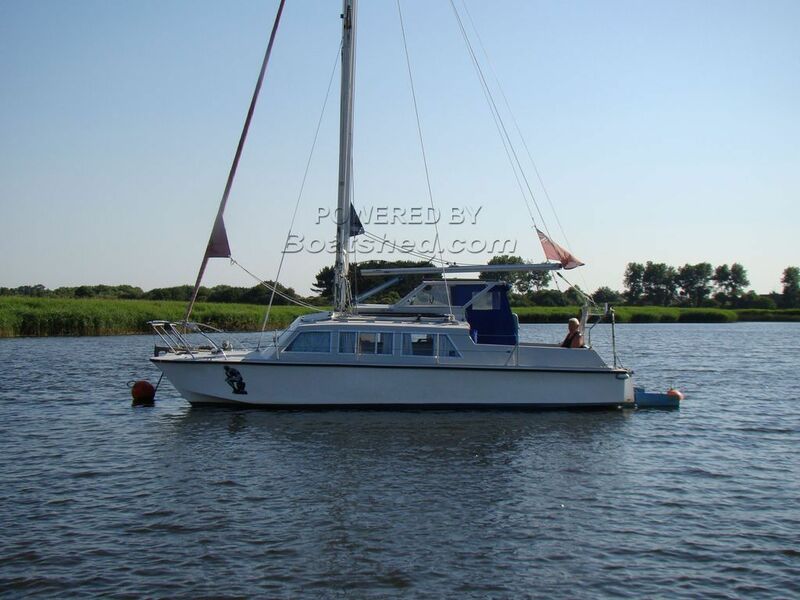 This Catalac 8M has been with the current owner for over 30 years and will be very sorry to sell her. they have enjoyed many cruises. She is always wintered ashore and cared for. A popular and comfortable cruising Catamaran. She is safe, easy to handle and a good fast passage maker. Ideal for the family due to her excellent accomodation. She could also be cruised through the canals, as her mast can easily be stepped. This Catalac 8m has been personally photographed and viewed by Ian Welsh of Boatshed Poole. Click here for contact details. Please note this comments section is public. Please do not post your personal details here. To enquire about purchasing this boat, please contact the broker directly at ian@boatshedpoole.com. Please read our commenting guidelines before posting.